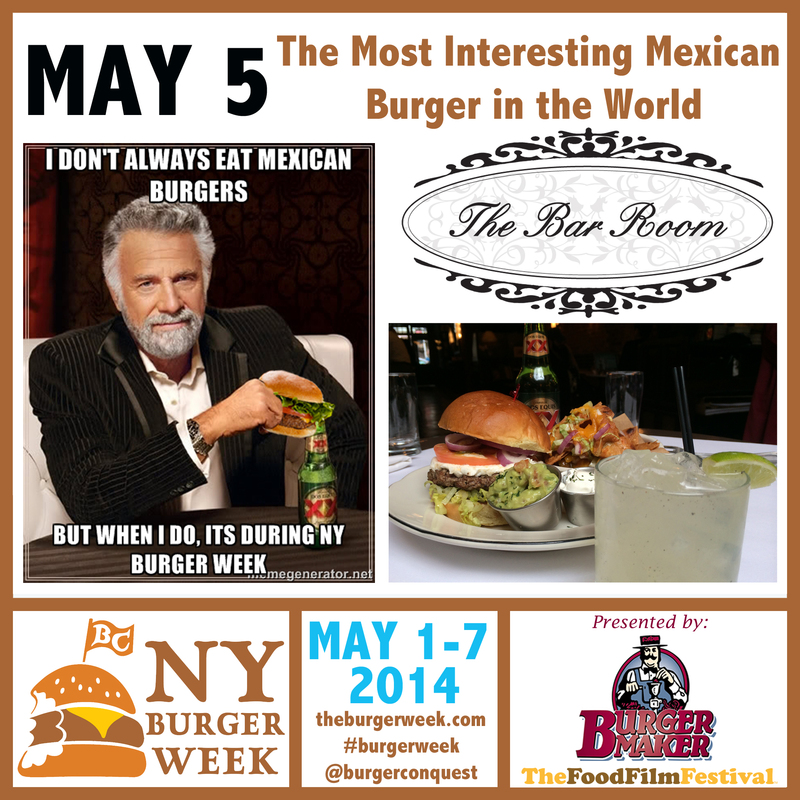 Burger Conquest announces the 3rd annual NY Burger Week from May 1-7, 2014. Offering gourmet blends, off-menu specialities, drink pairings – and the return of the Burger Crawl! – NY Burger Week will pay tribute to the world’s greatest sandwich, the Hamburger. Each restaurateur and Chef will be preparing a unique event that pays tribute to the Burger in their own way. 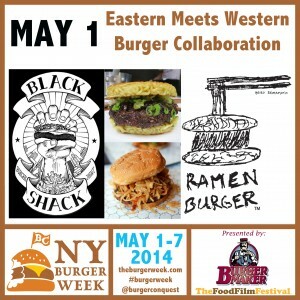 The Burger Week in New York kicks off May 1 at Black Shack (320 Lexington Ave) with a unique burger collaboration. Chef Jeffrey Maslanka brings off-menu burgers to the Burger Week, this time with Ramen Burger creator Keizo Shimamoto. Chef Jeff was the creative force behind the 2013 NY Burger Week off-menu Burger brunch at 67 Burger. For 2014, he and Shimamoto will work together to re-imagine each other’s Burger. Keizo has re-designed Jeff’s Western Burger – and it will be served along with Jeff’s take on the Ramen Burger. The dinner, limited to only 40 seats, will also feature a Black Shack off-menu Asian-themed side and a beer milk shake. 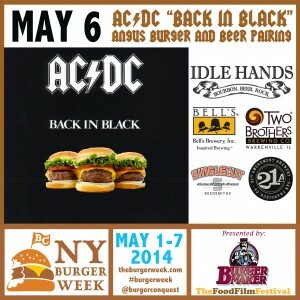 The 2014 Burger Week in NY returns to Idle Hands Bar (25 Avenue B) on May 6th with another installment of their rock ‘n’ roll burger and beer pairing dinners. 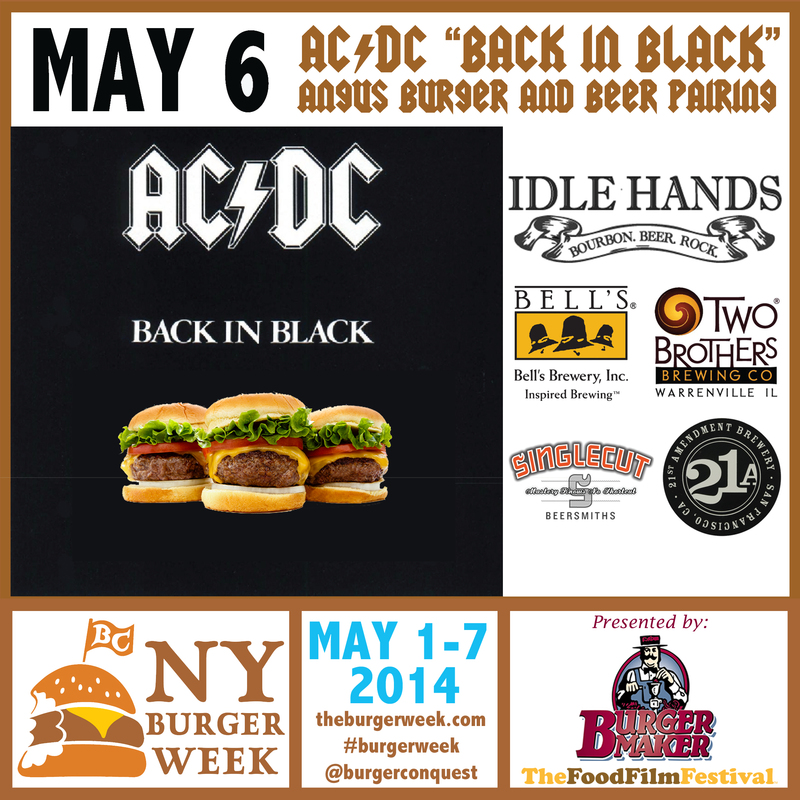 The event is called the “AC/DC Back In Black Angus Burger and Beer Pairing.” The menu will feature Burgers and beers “expertly paired” with each track on AC/DC’s Back in Black album by The Burger Week founder, Rev Ciancio. The album, originally released in 1980, has gone on to become the 4th highest selling album of all time. On the anniversary of its recording in New York at Electric Lady Studios, attendees will enjoy a selection of off-menu mini-burgers created by Chef Dennis Hatzinger using Burger Maker’s Custom Blend Certified Angus Beef Burgers, each themed with a different song on the album. Burgers will be served with a series of craft beers from Bell’s Brewery, Two Brothers, 21st Amendment and Singlecut Beersmiths. The dinner will also include an order of tater tots & a shot of whiskey. Four more events will be announced shortly as well as a week-long off-menu burger promotion with delivery.com that involves some of the best Burger restaurants in NYC. Restaurants, Chefs and sponsors interested in participating in NY Burger Week can find out how to get involved here. This entry was posted in Events, National Hamburger Month, New York, New York Burger Week and tagged Bar, Beer, best burger, breweries, burger, burger maker, ciancio, craft beer, david, events, Festival, food festival, food film festival, gourmet burger, happy hour, ny burger week, nyc, pairing, party, restaurant, rev, the burger week. Bookmark the permalink.